Today I would like to call your attention to a wonderful group of bloggers who are making a difference out there. Craft Hope is the brainchild of Jade Sims, and what began as an effort to do a little good out there has bloomed into 11 projects helping everyone from children at a Honduran orphanage, to a major online auction to benefit the victims of the 2010 Haiti earthquake. Their latest project is an effort to properly outfit midwives serving the many who are still without permanent homes in Haiti. There is much more detail here. I wanted to send out a call to those of you who have a little extra sewing time to join up and make some kits for these women who are helping mothers safely deliver their beautiful new babies. Some good friends and I met last week to do a little sewing and do a little good. We made tote bags, dolls, blankets and a few newborn hats. We all thought of our own tiny babies when we were making these things, and filled the projects with love for the new babies who will use them. Please head on over to Craft Hope and join their effort to make the world a little better. It's trunk show time at Treadle Yard Goods! We have a huge selection of her great patterns, along with the new fabric line Soul Blossoms. The patterns will not be discounted this time around, but we do have a few pieces from the "Love" line that are on sale by the front counter. Many of the display pieces are from Amy Butler's new book Style Stitches, we'll have a copy on the counter for your perusal. Come on by and take a look! I for one, have a deep need to make this little raincoat! 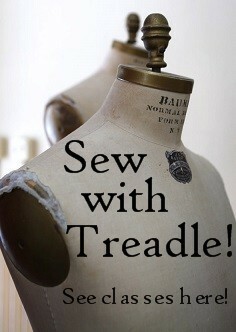 Come join us and share your love of sewing. Fashion Sewing Club is a monthly meeting (held the second Tuesday of every month) featuring garments, pattern modification and review, and the latest news in the sewing world. Come meet the Material Girls as they provide tips, techniques and new ideas that are sure to inspire you. High fashion, chic wear, proper fit, machine embroidery, children’s wear and Home Dec are just some of the topics we will explore. Whether you are an experienced sewer or just beginning – this club is for you! Bring Show and Tell! The fee is $10 (however, your first meeting is free!) and can either be prepaid here or paid at the meeting. The next meeting is TONIGHT, January 11, at 6:30 p.m, and is held in Treadle 2. Please join us for the fun! This week I was working with my friend Jess, of My Friend Jess, and she had the most inspirational dress on. It was agreed, that she just had to share it here. The fabric is a wool boucle made up in a vintage, 1970's pattern. In true Jess fashion, pun not intended, she added the tree and bird outlines in felt. Such a striking and whimsical way to let a garment make a statement. Please don't hesitate to head on over to the Treadle Yard Goods flickr group, and share your latest creations!